I was actually on my way out of the thrift store when I saw it. 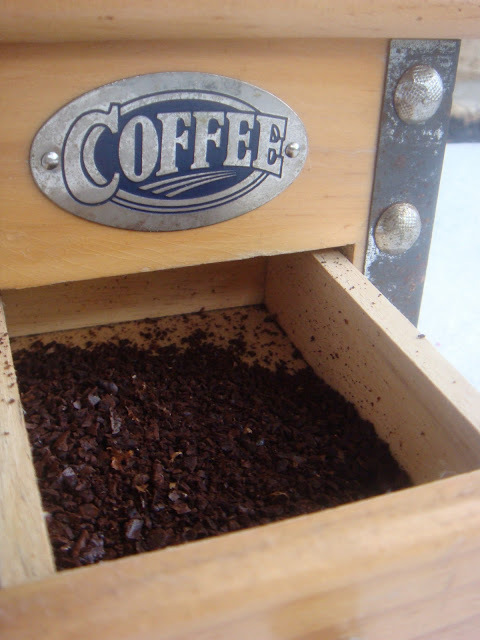 An old-fashioned coffee grinder - the kind where you pour the beans in the top and grind them up yourself into a little drawer. You can actually smell the beans being ground up. It even says 'coffee', in case you forget. I spent way over my thrifting budget on it ($15 - eek!). But now it's mine. And you know what? 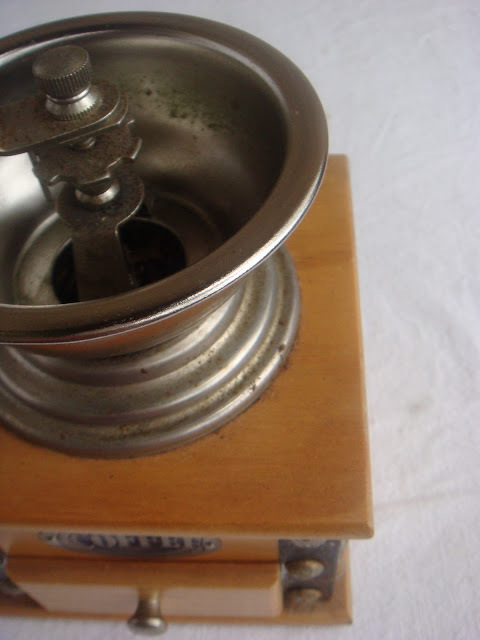 It doesn't grind as finely as my plug-it-in-and-push-a-button grinder. It's slower, and the ground coffee doesn't always go into the little drawer. But I prefer it nonetheless. Why? Because it makes me feel like the coffee is mine. woohoo! such an awesome find. I work at a Starbucks and I keep hearing how using a coffee press (and course-ground beans) make for the best coffee. I'm def going to try that-- plus a coffee press is a lot cheaper than a coffee machine. It's gorgeous, so much character. No wonder you love it. Oh, oh, oh! Yes, that's an awesome find! I've been on the lookout for one of those to go with my pour-over drip. Hope it's wonderful for you. Definitely a great buy! Thanks guys! And boy, Karen didn't you make me feel clever! I have to tell you, this coffee is way better than the pre-ground stuff I've been buying. But the only problem is that I sit at home and drink a whole pot-full rather than a single latte out! Eek!